Fellow fans of old British strip Frankie Stein prepare for a shock to your bolts, because U.S. comics company Image Comics have announced their own version premiering this September! The latest edition of the Diamond Previews comic catalogue advertises that the full colour 48 page $12.99 Frankie Stein book will be published in the USA on September 7th (or Sept. 8th in the UK and worldwide). Written by Steven T. Seagle and drawn by Marco Cinello the book promises to be "totally appropriate for kids of all ages". 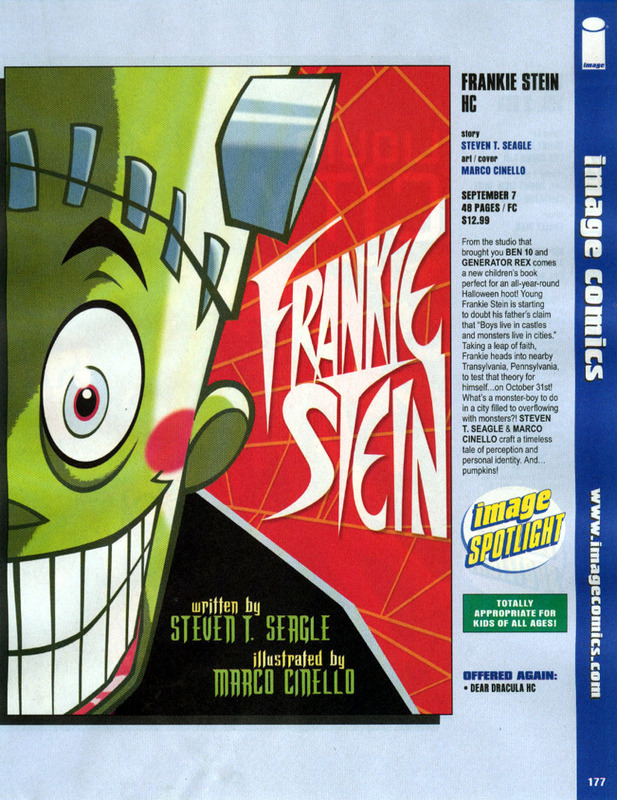 From the synopsis, it's evident that this Frankie Stein has no relation to Ken Reid's 1960s comic-horror classic, or Bob Nixon's affable monster of the 1970s, but it has its own take on the monster-and-father aspect. "Young Frankie Stein is starting to doubt his father's claim that 'Boys live in castles and monsters live in cities'. Taking a leap of faith, Frankie heads into nearby Transylvania, Pennsylvania, to test that theory for himself on October 31st! What's a monster-boy to do in a city filled to overflowing with monsters?" Described as "a timeless tale of perception and personal identity. And... pumpkins!" 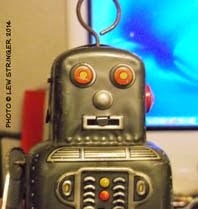 it does sound much more sugary and cute than the Frankie Stein we were used to. As IPC's Frankie Stein has been out of print for ages and the creators of the Image version are based in the USA I very much doubt they'd even be aware of the British Frankie. I'll take a look at the Image version when it appears and while I wish the creators every success with their book I suspect I'll still prefer the manic brilliance of Ken Reid's original (below); a series that deserves its own collection. Frankie Stein strip from Wham! 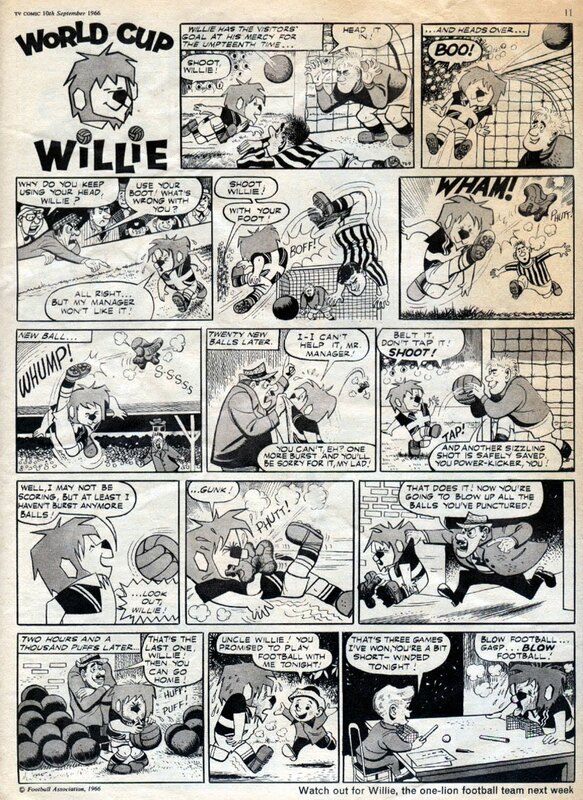 No.78, 11th December 1965 drawn by Ken Reid. 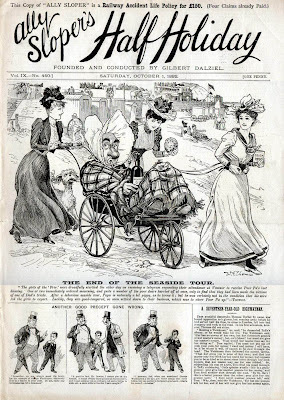 Concluding my brief look at summertime strips from the weekly comics here's another bucketful starting above with a cover to Ally Sloper's Half Holiday dated October 1st 1892. I've shown this cover on the blog before but it's worth repeating for this theme. Great W.F. Thomas artwork from the days of beach huts and overdressed holidaymakers. 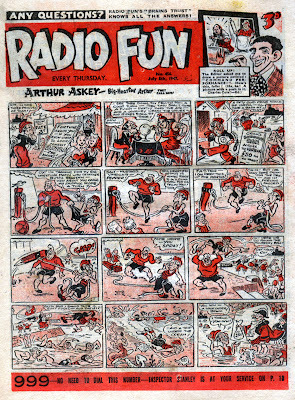 Zooming forward in time over 60 years later it's a Sally Barnes strip from TV Fun No.100, August 13th 1955 (below). Reg Parlett is the artist and the crowds on the beach are no exaggeration. In those days British beaches were packed, particularly when factories closed for a summer holiday week and all the workers took a break at the same time. 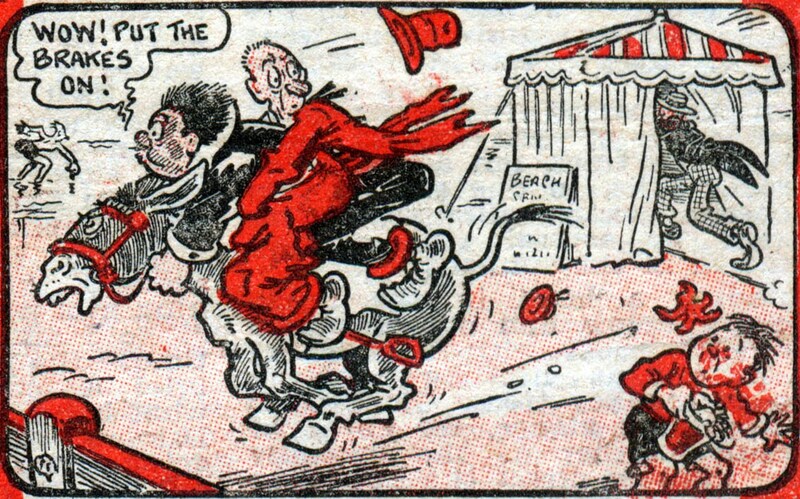 Moving on to 1st September 1962 and the girls' comic June featured an amusing little gag strip called Jenny. Does anyone know who drew this? 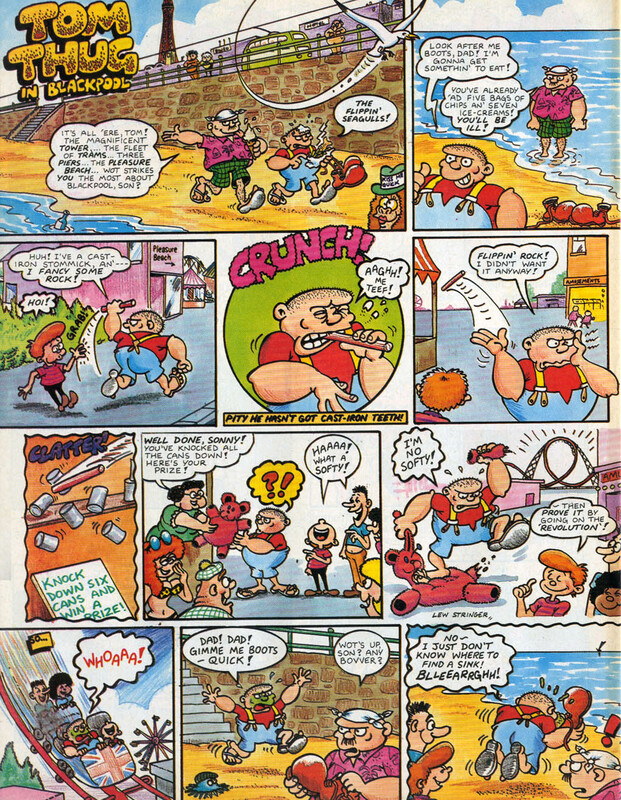 A few years later and Ken Reid's Frankie Stein goes to the beach in this funny full pager from Wham! No.55, 3rd July 1965. 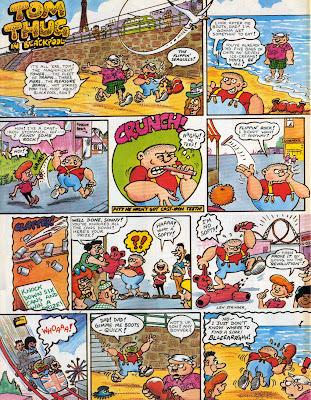 Notice how the storyline is much more complex than the basic seaside stories seen in the earlier comics (shown in part 1). 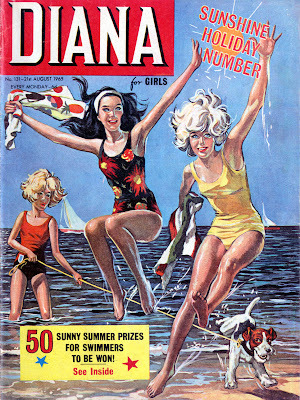 As far as I know, D.C. Thomson's Diana weekly never had an additional Summer Special, at least not in its early years. 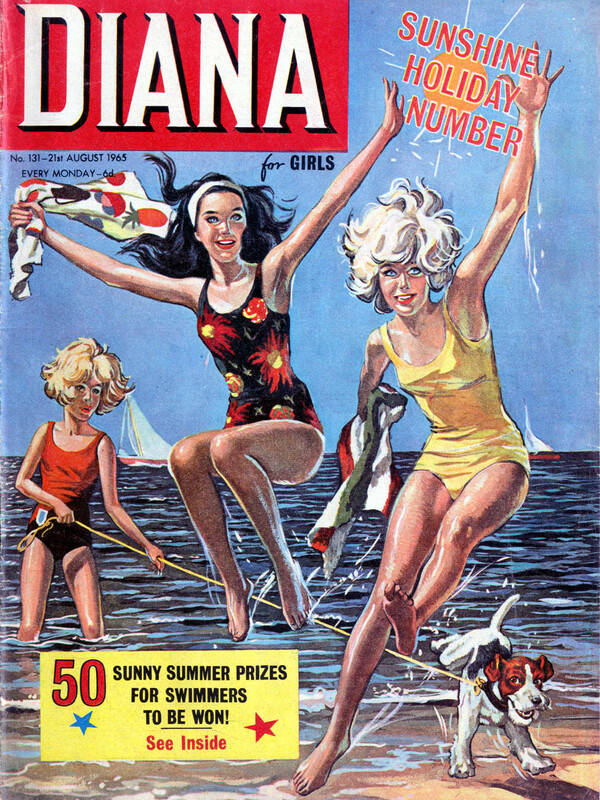 Presumably Thomson's felt that this big 24 page glossy was like a summer special every week, hence the 21st August 1965 issue being the "Sunshine Holiday Number" as part of its regular run. 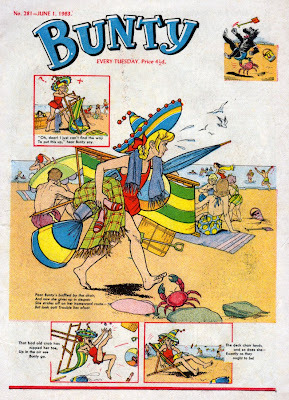 Unfortunately despite the lively beach painting on the cover none of the the interior strips have summer holiday themes. IPC Magazines liked to use basic, simple formulas for their humour strips and Beat Your Neighbour used the old theme of rivalry to funny effect. 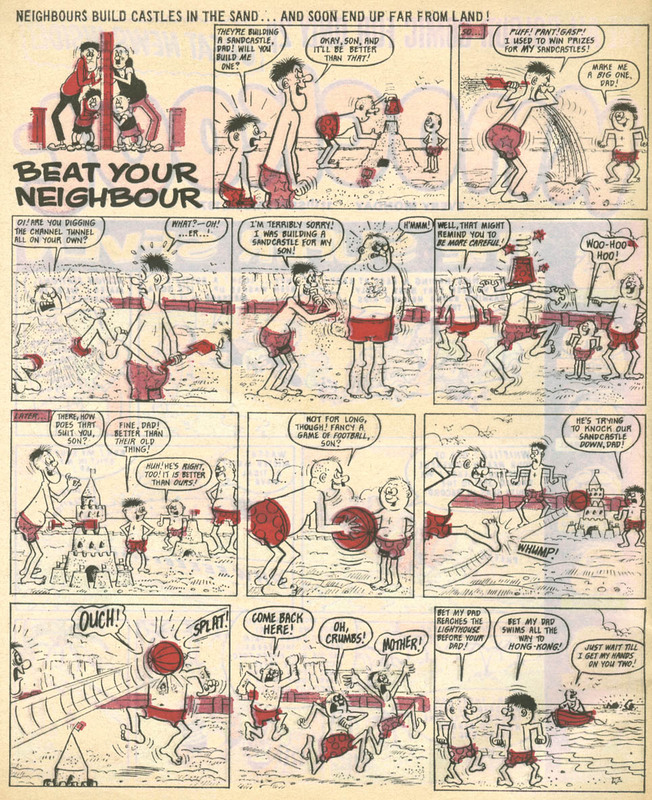 Appearing a year before the tv sit-com Love Thy Neighbour, this strip of warring neighbours appeared in Knockout dated 11th September 1971. Korky the Cat often appeared at the beach on the cover of Dandy Summer Specials but here in the weekly edition of The Dandy dated August 31st 1974 he and the Kits make do with a greenhouse and some builder's sand. Artwork by Charlie Grigg. Finally, from Oink! No.8, 9th to 22nd August 1986, Tom Thug in Blackpool for the first time. 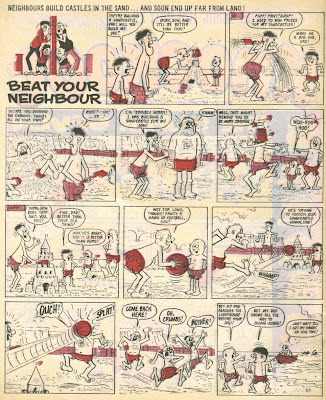 The "Tom Thug on 'Oliday" strips were a recurring summer theme I'd use throughout the strips run. Some "sick" humour in this one I'm afraid, quite literally! 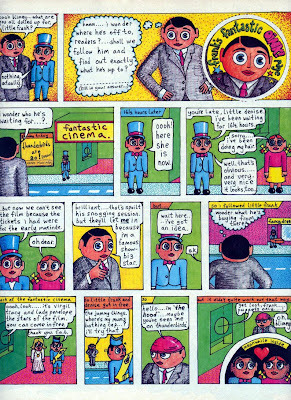 (This was the first comic strip I'd drawn in colour. A bit ropey in places unfortunately!) 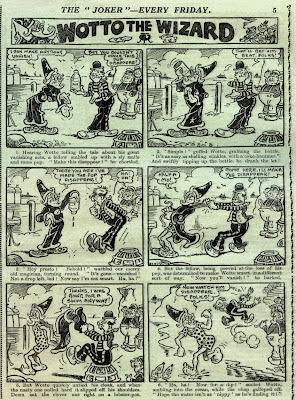 By the way, the final panel had some dialogue altered by the editor, with "bog" replaced by "sink"! 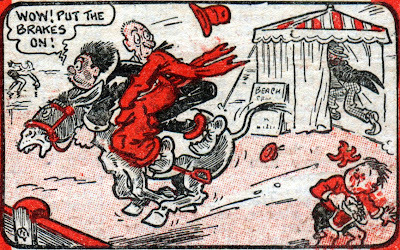 That's it for this seaside trip through comic history. 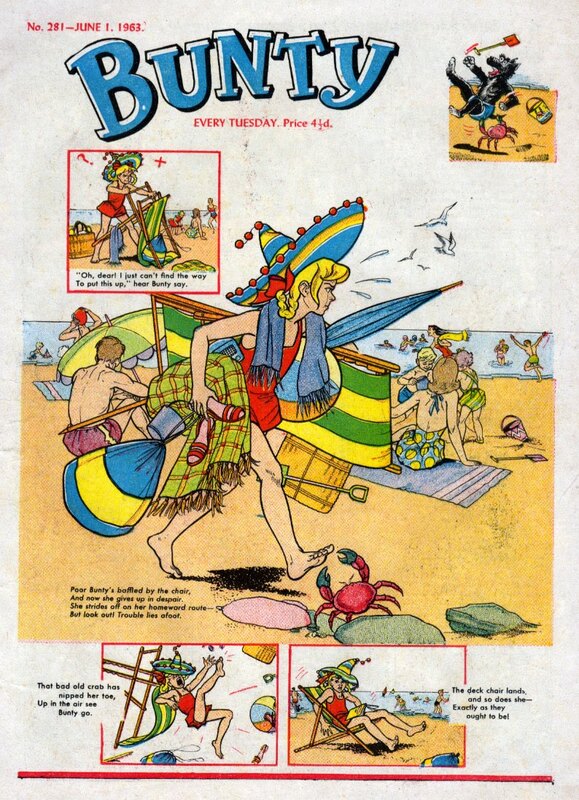 If you're heading for the beach this week have fun and watch out for crabs and beach bullies! 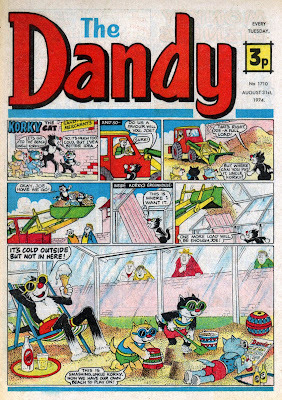 This is the time of year when it was traditional for Summer Specials to begin appearing in the shops; annual bumper versions of the weekly comics. Sadly, as mentioned here last year, the Summer Specials have now practically fizzled out, replaced by a few hardback "Summer Annuals". 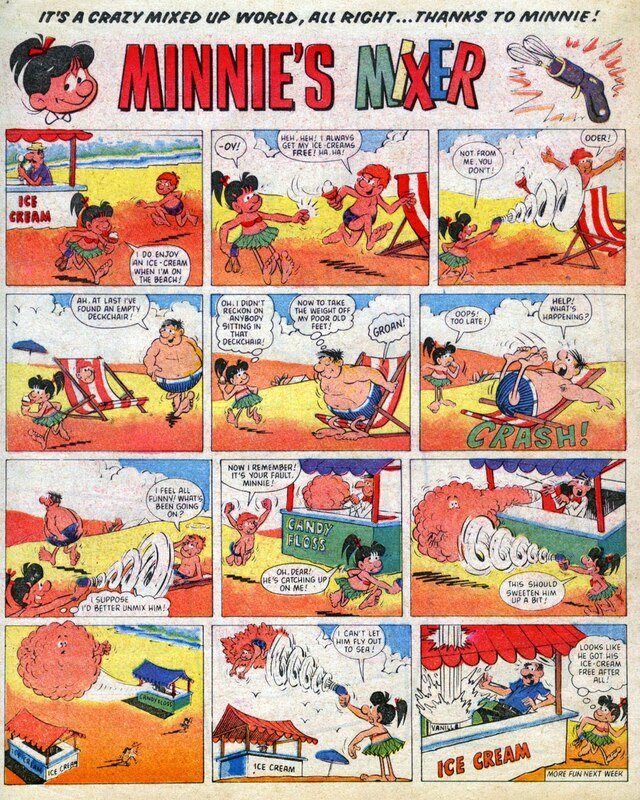 Most summertime beach-related strips featured very basic slapstick. 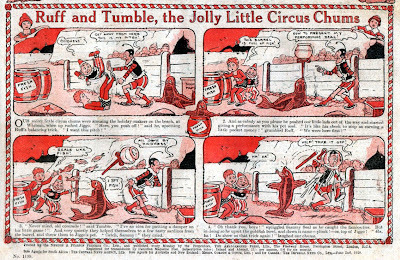 Here's Ruff and Tumble, the Jolly Little Circus Chums from Lot-O'-Fun dated June 2nd 1928. 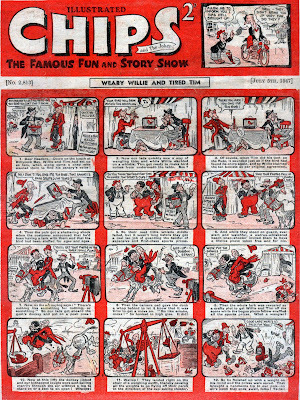 The comic was aimed at young children so the storyline is simple and relatively gentle cause-and-effect comedy. 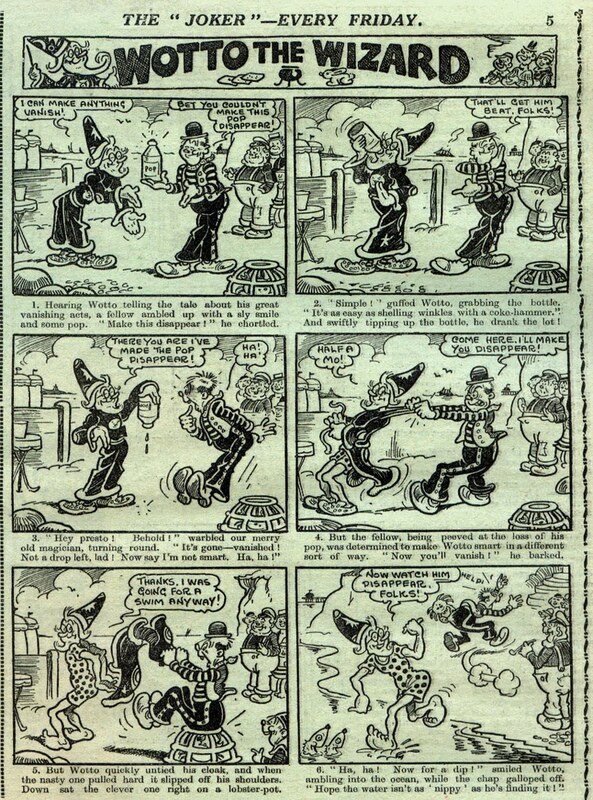 Moving forward a few years to The Joker dated July 28th 1934 we see Wotto the Wizard play an age-old prank to make pop disappear. (Or perhaps it wasn't so age-old in 1934.) 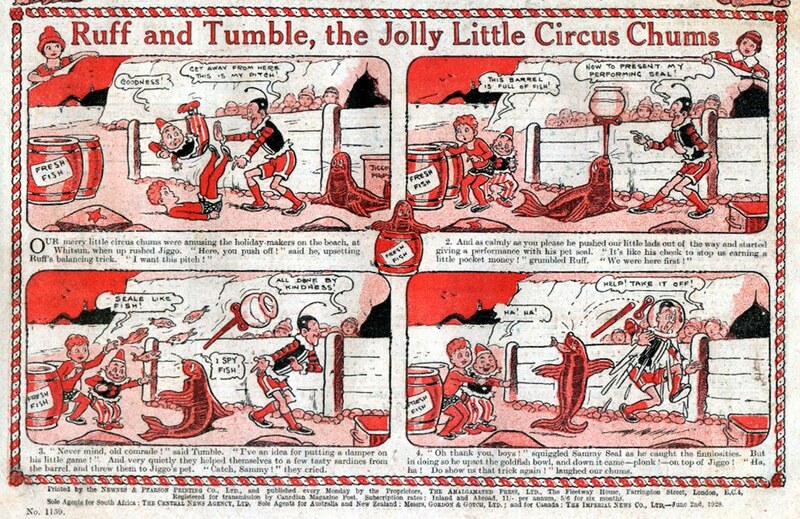 Watch out for that crab folks, it has a habit of turning up in seaside comic strips again and again. 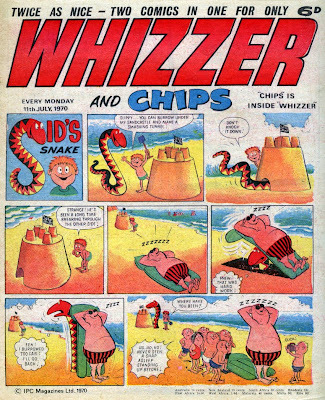 It's July 5th 1947 and on their permanent cover residence in Illustrated Chips Weary Willie and Tired Tim become beach detectives fpr the week, illustrated by the brilliant Percy Cocking. 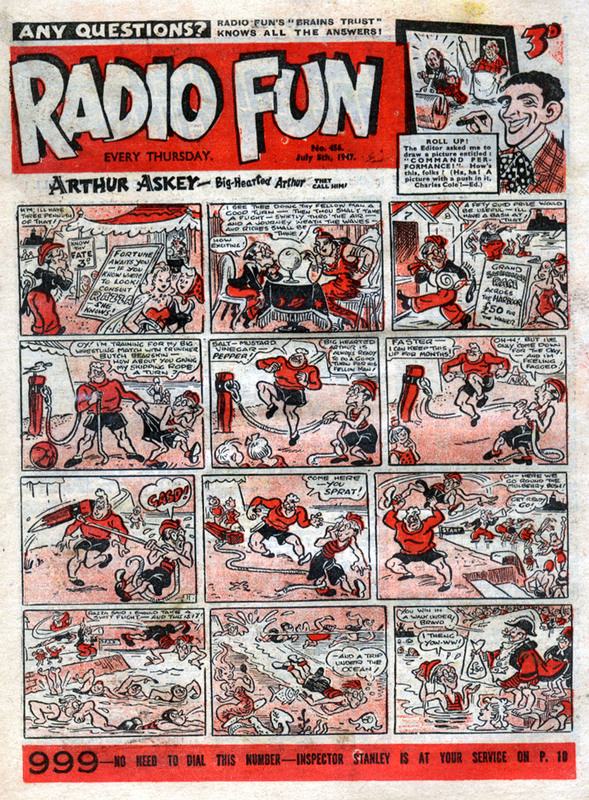 That very same week in 1947, Radio Fun had Arthur Askey come up trumps after meeting a beach bully. Fast forward a few years to June 1st 1963 and cover star Bunty encounters one of those comedy crabs. Art by Doris Kinnear. July 11th 1970 and Sid's Snake enjoys the beach in Whizzer and Chips' first summer. Artwork by Mike Lacey. 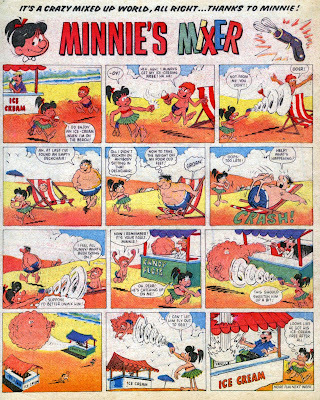 On the back page of the same issue, the surreal Minnie's Mixer thwarts the plans of another beach bully. 1976 was a real scorcher of a summer and this cover of Tammy by John Richardson reflects that. Dated 11th September 1976 it shows a girl and her Mum (or big sister) returning from summer holidays in the UK whilst a travel agent looks on, possibly considering his losses. The term "unique comic genius" is often used automatically whenever a comedian passes away but in the case of Chris Sievey, who died this morning, it's a suitable description indeed. 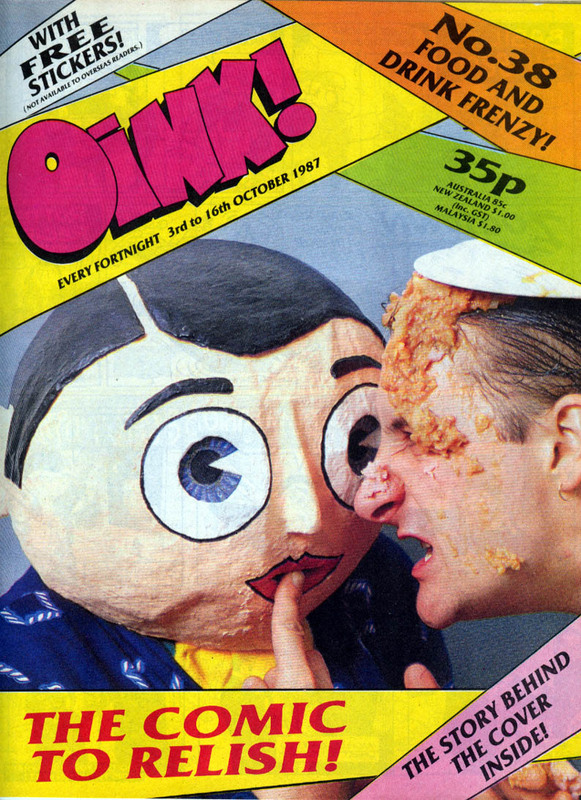 Chris, aged 54, was the creator of his showbiz persona Frank Sidebottom. You may remember Frank Sidebottom from his tv series Frank Sidebottom's Fantastic Shed Show in the 1990s, or even the comic strip that ran in Oink! in the 1980s, written and drawn by Chris himself (as Frank of course), or from his live performances over the years. I saw his act twice about 25 years ago and the audience were in hysterics throughout. 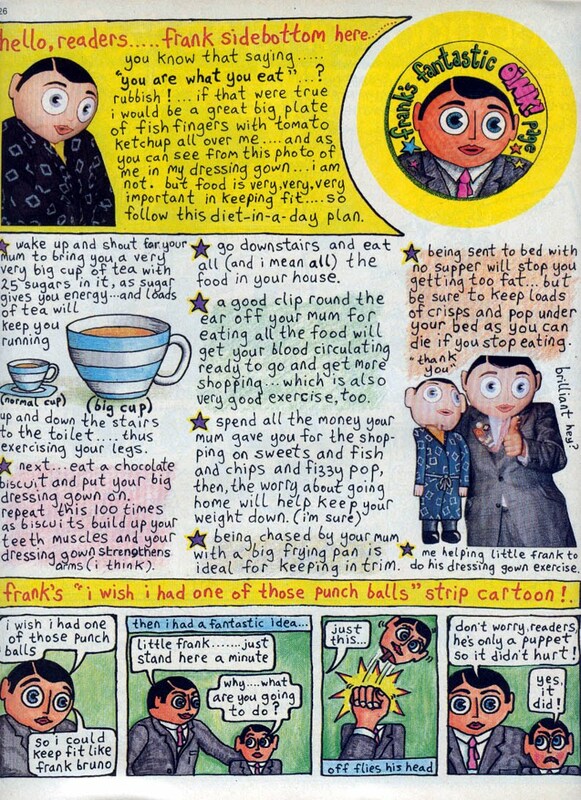 You see, Frank had a distinctive appearance; he had a papier-mache head. And in case that wasn't funny enough, he was accompanied by his puppet, Little Frank, who had an identical little papier-mache head. You're right; you had to be there. And his fans were there, enjoying every minute of it, right up to recent years by following him on Facebook, Twitter, and MySpace. 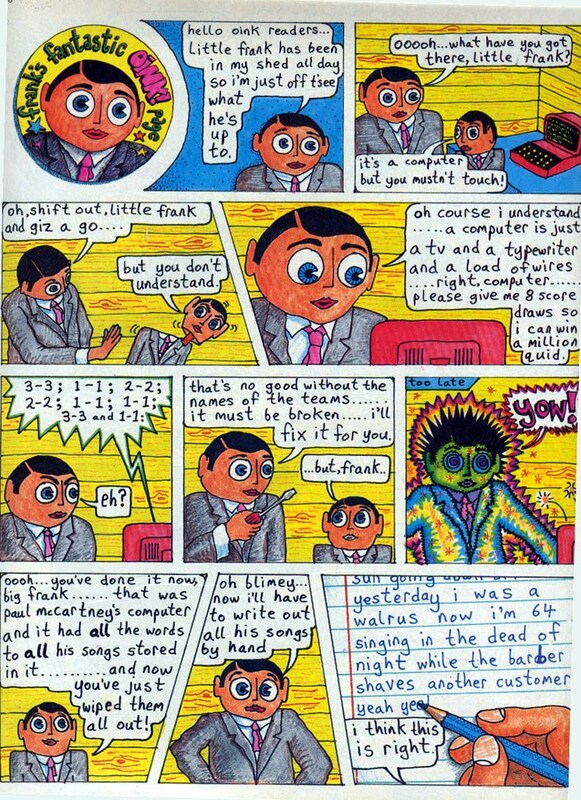 Frank Sidebottom never became the huge tv star he deserved to be. Television couldn't pigeonhole someone so unique and he was a performer you either "got" or you didn't. For those of us who did "get" his comedy he'll always remain forever fantastic. The media's at it again. 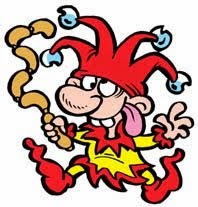 Redtop Sunday paper the News of the World is today attacking the new Beano character Uh Oh, Si Co because it may allegedly lead to the bullying of children with mental health problems. Although the newspaper fails to provide a shred of evidence that comics incite bullying, it manages to rant on about it for several paragraphs, roping in mental health organizers for soundbites. In truth, Uh Oh Si Co (a spoof of the name Yu Go Oh from Japanese Manga) is exaggerated cartoon fun, drawn so over the top by the brilliant Nigel Parkinson that I fail to see how anyone could be offended by it. 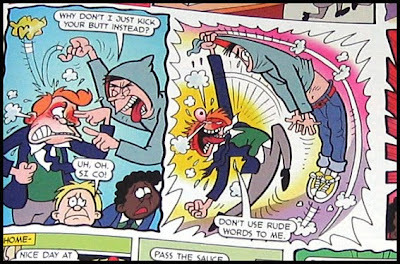 It's not mocking people with mental heath problems, it's just a lively cartoon strip that exaggerates Simon's reactions for comic effect. 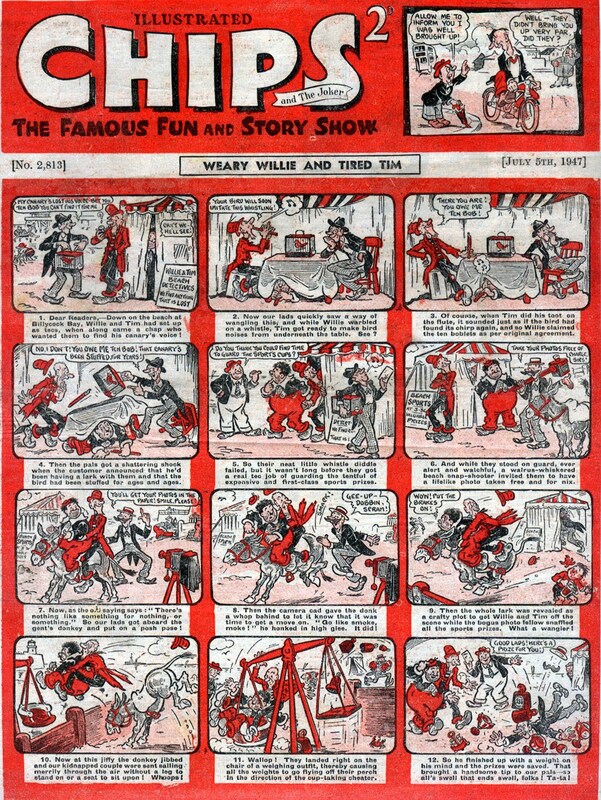 Uh Oh Si Co has only been running in The Beano for two weeks. Along with two other new strips, it's part of the latest Comic Idol feature where readers vote for their favourite to become a regular series. Presumably the strip will soon be rested to wait for the votes to come in, at which point the News of the World will presumably claim victory for "banning" the strip. So it goes. Issue No.2 of Future's new quarterly venture Comic Heroes magazine came out this week and it's another packed edition that should have something for every fan of comics. 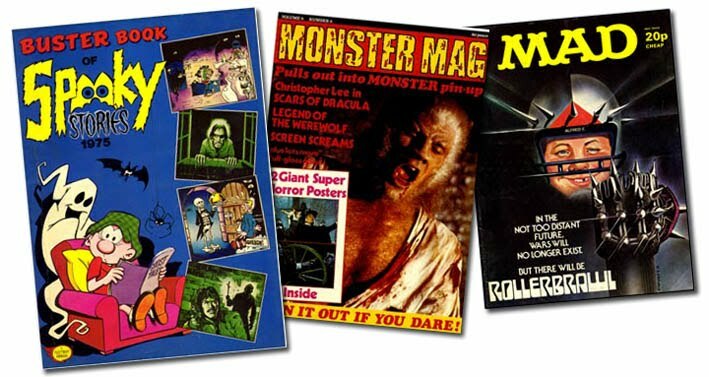 Once again the magazine comes packaged in a sealed card envelope along with three free gifts. Whilst this frustratingly prevents potential customers from browsing through the mag there's enough information given on the front and rear of the package to whet one's appetite. 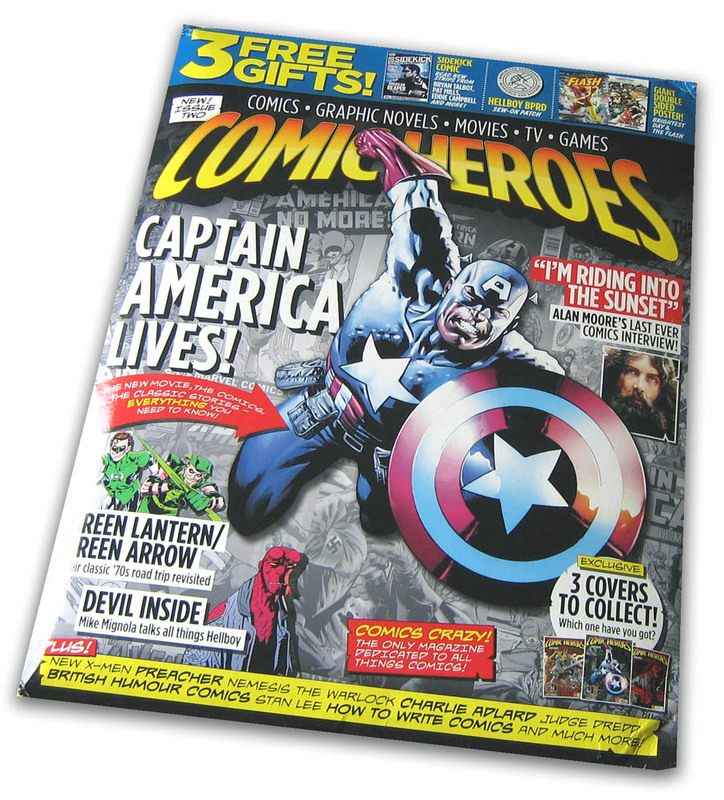 The package design also means that Comic Heroes looks bigger than other magazines and that it stands out on the shelves. It also means that the mag hasn't been pawed through by the greasy-handed mouth-breathers who often read genre magazines in the shop. Enough about the packaging. How about the contents? 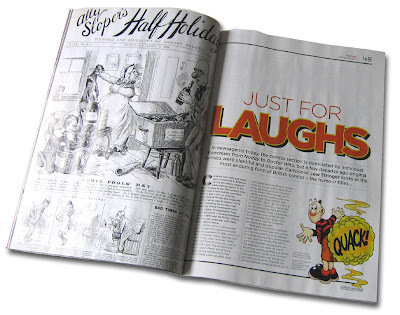 Well, announcing my vested interest up front one of the features this issue is called Just for Laughs and it's a six page history of UK humour comics wot I wrote. Condensing over 100 years of history into 2,200 words was quite a task but I hope I've covered all the important moments and given some of the key players their due. 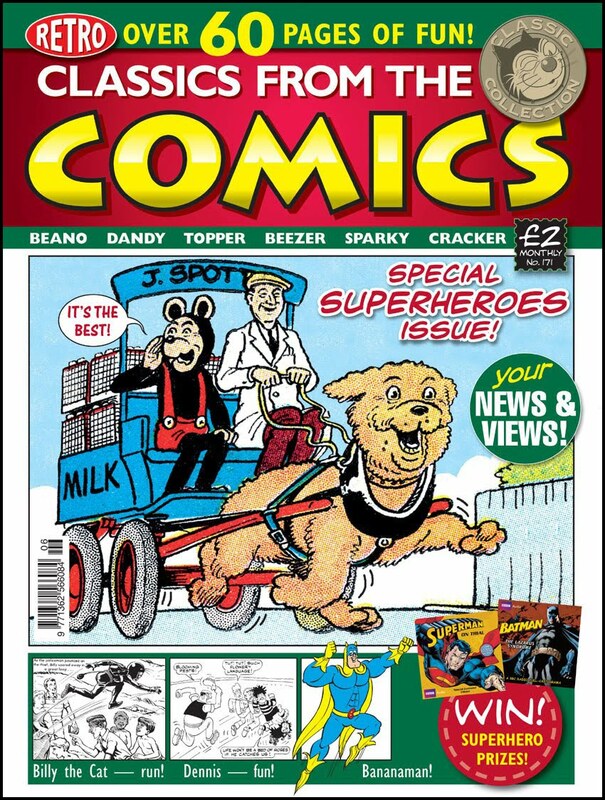 If just one Marvel fan who buys this mag for the Captain America article has a better respect for British humour comics after seeing my article then I'd consider it well worthwhile. 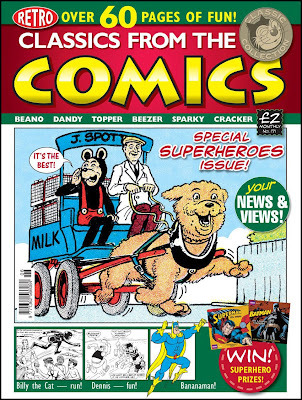 There are other items pertaining to British comics in this issue too. 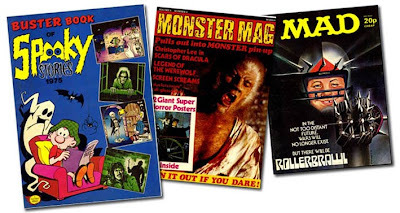 Pat Mills and Bryan Talbot cover the story behind The Gothic Empire aspect of Nemesis the Warlock, (although Bryan Talbot's comments about ex-2000AD art editor Robin Smith were changed to Ron Smith for some reason). There's also a tribute to the late John Hicklenton, and a ten page interview with Alan Moore in which he has a right old go at the comics industry. Other UK creators are to be seen as well, such as Mike Perkins and Charlie Adlard, plus people such as Al Ewing, Andy Diggle and Tony Lee contributing to part two of the How to Write for Comics feature. 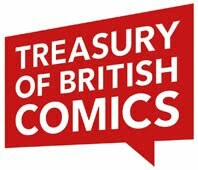 Sticklers of British comics may think such creators don't "count" as UK writers as they mainly work for US comics, but these days that's irrelevant as the whole world is a potential market. Comics are more international than they used to be, and Comic Heroes celebrates that fact. 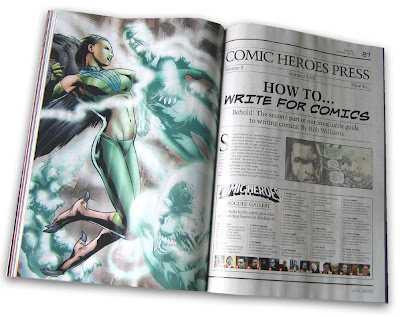 True, most of the material in Comic Heroes leans towards American comics, but editor Jes Bickham is open to featuring other comics as evidenced by my article and the five page feature A Beginner's Guide to Manga. 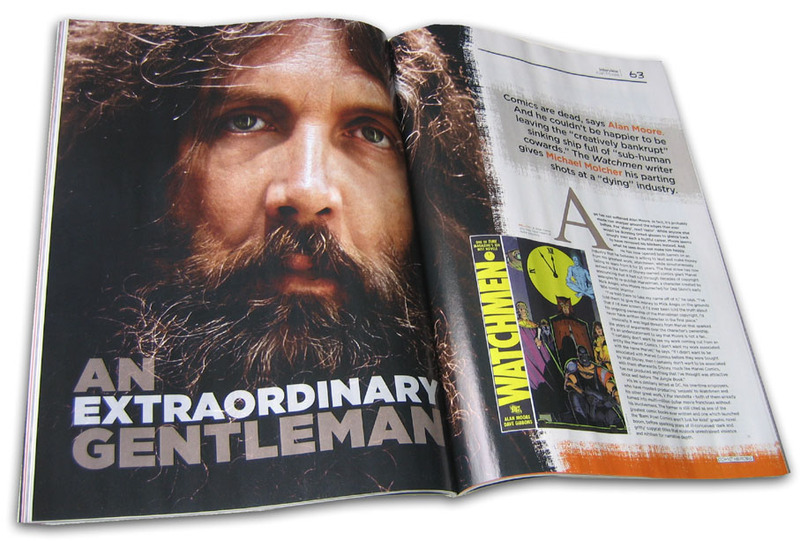 Clearly this is a magazine that just wants to celebrate comics without any limitations. Other items in this issue include retrospectives of Captain America, New X-Men, and the Green Lantern/Green Arrow issues, an interview with Mike Mignola, mini-interviews with Stan Lee and Chris Claremont, reviews, news, and other material packed into 132 pages. 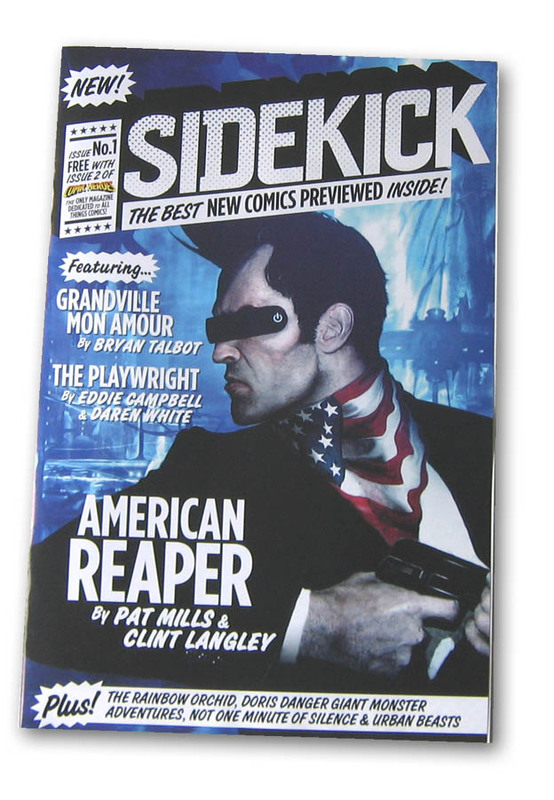 There's also a bonus comic in the form of Sidekick No.1 which features 36 pages of previews of upcoming comics such as the next Grandville book by Bryan Talbot and book 2 of The Rainbow Orchid by Garen Ewing. 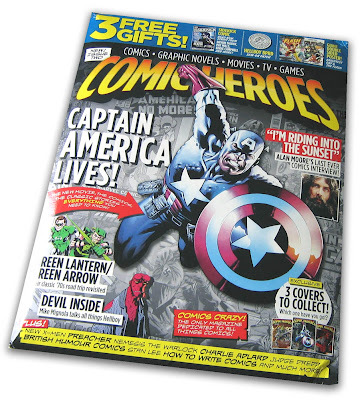 I know there's been criticism of the hefty £7.99 price tag of this magazine but having given it some thought Comic Heroes is fairly priced compared to similar genre magazines. Crikey! is a fiver for 52 pages, Alter Ego is about £6 now for 80 pages, and Doctor Who Magazine is £4.20 for 68 pages. 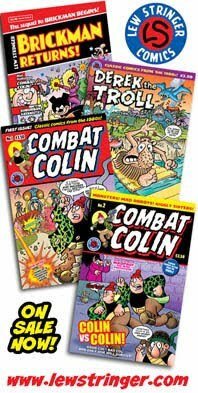 In relation to that, £8 for 148 pages of Comic Heroes sounds reasonable to me, and with the small typeface that CH uses there's a lot packed into each issue. 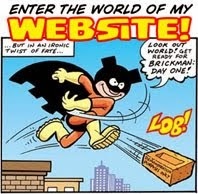 It's not an easy time to launch a new magazine, particularly one with a minority interest, but I hope fans of the medium get behind Comic Heroes and support it. The next issue will be out on September 16th but for the moment issue 2 should provide a good summer's read. Next week's issue of Classics from the Comics (on sale 24th June) features a small selection of vintage UK superhero strips from the D.C. Thomson archive. Unseen for many years, The Amazing Mr.X from 1944 is one of the strips spotlighted, with artwork by Jack Glass. (Private enquiry agent Len Manners dons "a queer costume, black skin-tight trousers and white jersey" and uses amazing strength that he can "summon at will" to fight crime.) It'd be great to see more of this strip in future issues. 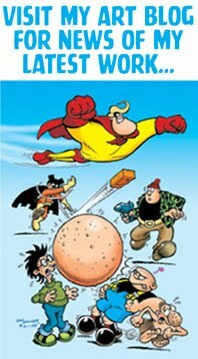 Another classic superhero featured includes The Danger Man from a 1959 Beano, who gains momentary super-strength from powder hidden inside a fake tooth! There's also a Billy the Cat story from 1967 and a Jack Flash (The Flying Boy) strip from 1949. Having more adventure strips in this issue gives a good balance to the comic, rather than the usual 60 pages or so of humour strips. Ron Smith's Space Kids continues, although personally I'm wishing they'd have chosen something a bit more dramatic such as Back to Zero (from The Topper, mid-1960s) or The Crimson Ball (Dandy, 1963/64). 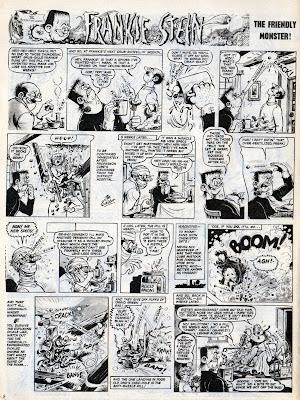 As ever, there's a good selection of humour strips, including a Ken Reid Big Head and Thick Head from 1963 and a Davy Law Corporal Clott from 1965. Another odd move is that a few of the pages have been resized for some reason. 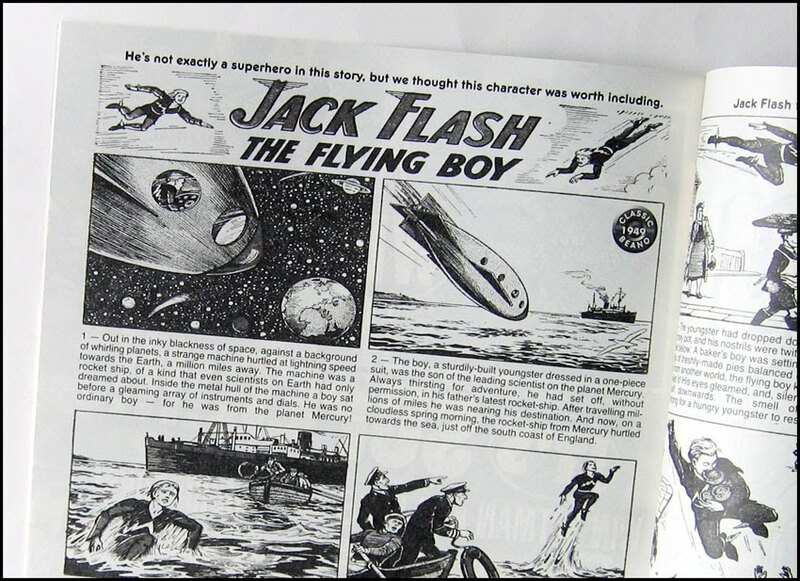 The Jack Flash strip has been "squashed" so that anything circular (such as the Earth in the example above) now looks eliptical, and the Roger the Dodger strip on page 66 has been elongated. I'm probably being over-critical and most readers won't notice it, but I found it a bit distracting and unnecessary. They couldn’t know then that the day of victory would come in May, 1945, and for those six years of savage war, Clive Sterling, Royal Navy, would sail hostile seas and face deadly danger almost every day in that fight for freedom. Two pilots duelling to the death…just what you’d expect in the days of the Second World War. But what was unusual about this pair — one British, one German — was that there wasn’t an aircraft in sight and they were fighting on the ground. This clash was just as deadly, though, for on the German’s right hand was a heavy spiked and studded gauntlet…one blow from which could be fatal! Central Russia, 1918. An armoured train, bristling with artillery and machine guns is locked in a duel to the death. But what with? A spindly freakish contraption seemingly too fragile for battle. Yet this nightmare of a device blasting away with its own deadly guns towers over the train. Where has it come from, this monster of war? And why is it crewed by the Royal Naval Air Service? The most bizarre tank in the world? A fitting test for draughtsman John Ridgway’s abilities. A cloaked and masked figure who stalks the city of Paris protecting the underdog and escaping through the sewers to outwit his pursuers — obviously this is the invention of a Victorian mystery writer, not a real person. Yet, this was 1944 and, if you asked the German authorities or the pro-Nazi French Militia, you would find that this character was all too real. And all too deadly. Another collaboration of the talents of Keith and Norman, the same team who brought the Headline Heroes to life. The characters and some of the out line was suggested by Keith and Norman put flesh on the bones. 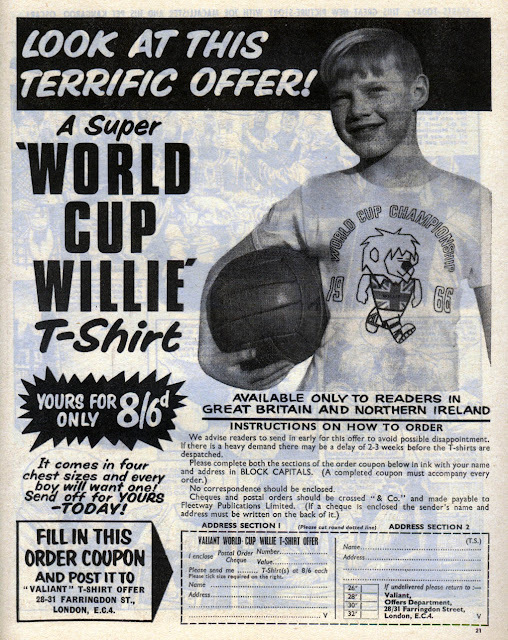 Valiant also hopped on the bandwagon with the T-shirt offer shown at the top of this post and The Valiant Big Book of Football. 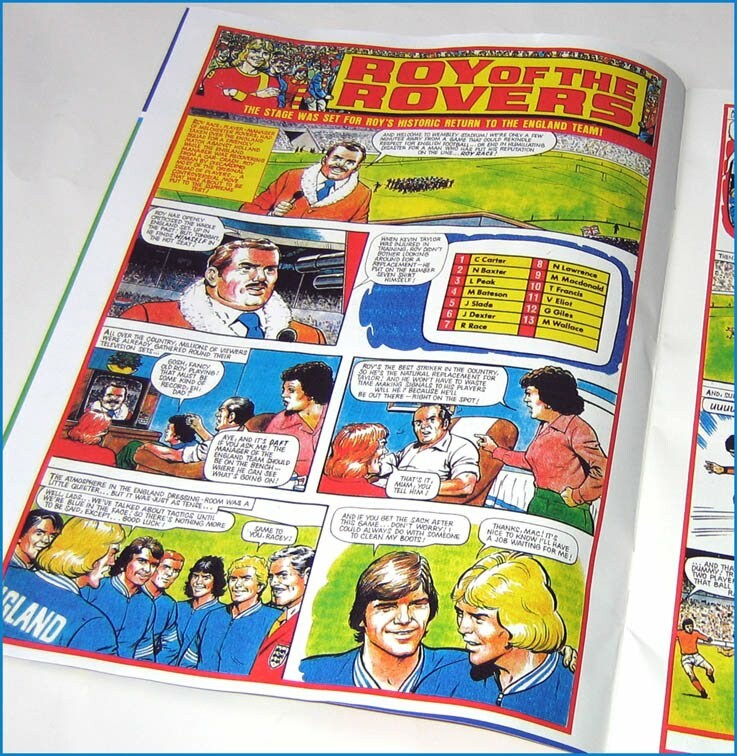 It wasn't really a book though, but was instead a series of four page pull-outs that built up to a 32 page comic over eight weeks, (issues 30th April - 18th June inclusive) printed on traditional "sport's pink" paper. 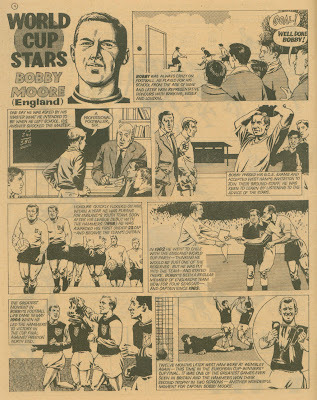 No doubt other comics of 1966 also focused on the World Cup but, from what I remember, not to a great extent. 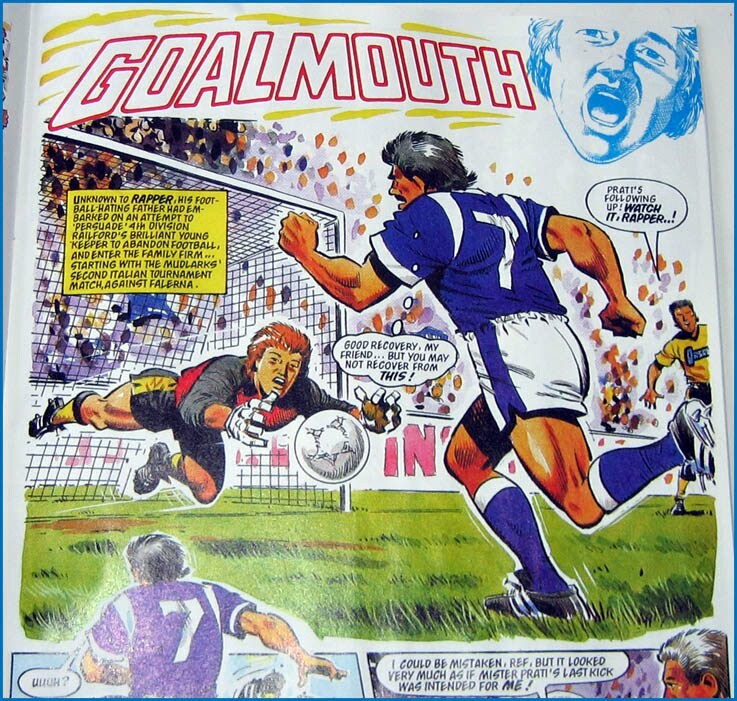 However, never being a competitive sports fan I was happy at the time to avoid comics like Victor and Tiger and escape into the pages of Odham's Smash! 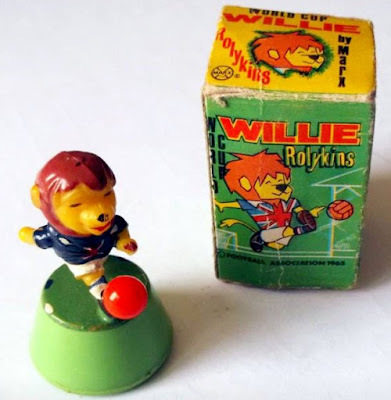 and Wham!, neither of which ever featured sports stories as I recall. Today, as a contributor to comics, I'm happy to draw football stories on occasion and in a few weeks Team Toxic has a World Cup theme in the next issue of Toxic. More on that when the issue appears. 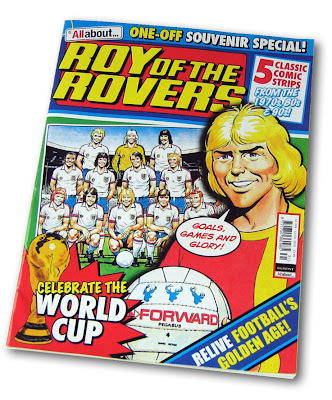 Next Wednesday (June 16th) Egmont release the 52 page full colour comic All About Roy of the Rovers. 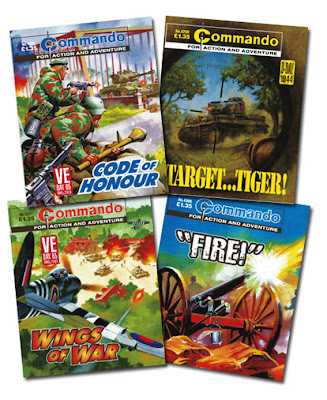 The publication is part of Egmont's regular All About series which focuses on a different topic every issue. (I understand the current one spotlights Prince of Persia.) 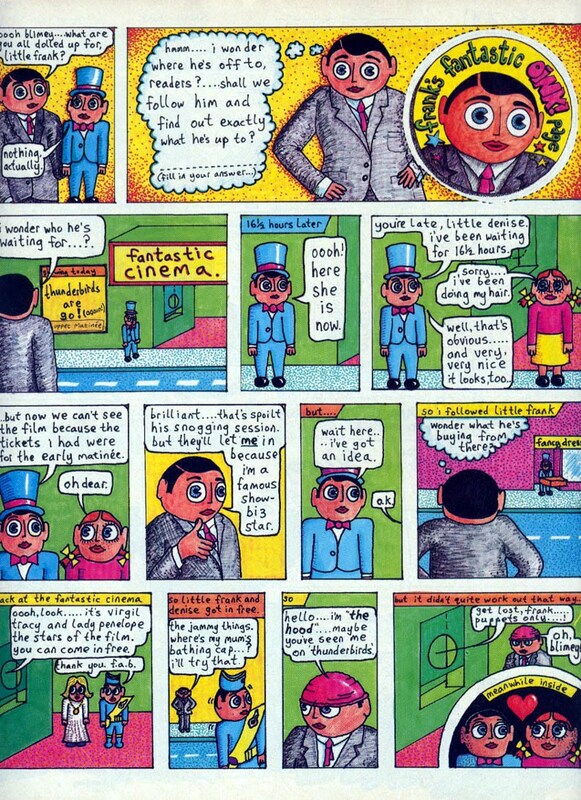 Usually, All About only features magazine material so it's good to see an issue containing comic strips. 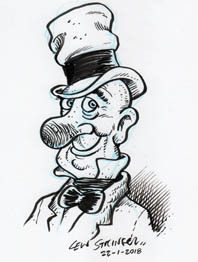 There are five comic strips in all, selecting material from the late 1970s to the 1990s. The issue kicks off with eight consecutive parts of a 1978 Roy of the Rovers story concerning Roy Race forming an England squad that includes real-life 70s footballer Trevor Francis and, in a rare UK comics crossover, Nipper Lawrence (from Tiger's long running Nipper strip). 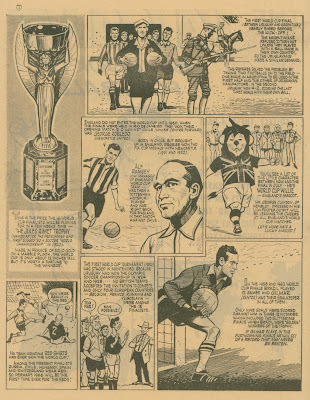 Artwork by David Sque, now the artist on the Daily Mirror's Scorer strip. 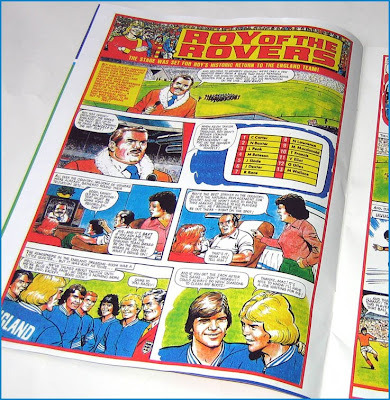 Two other Roy of the Rovers stories are included (drawn by Jim Eldridge and, I think, Mike White) which, at eight pages in length each, I presume are from old annuals or specials. There's also a four part Goalmouth story by Tom Tully and John Cooper which I think is from the 1990s, and a four page Andy Steel Playmaker story by H.Manning and G. Marchetti. 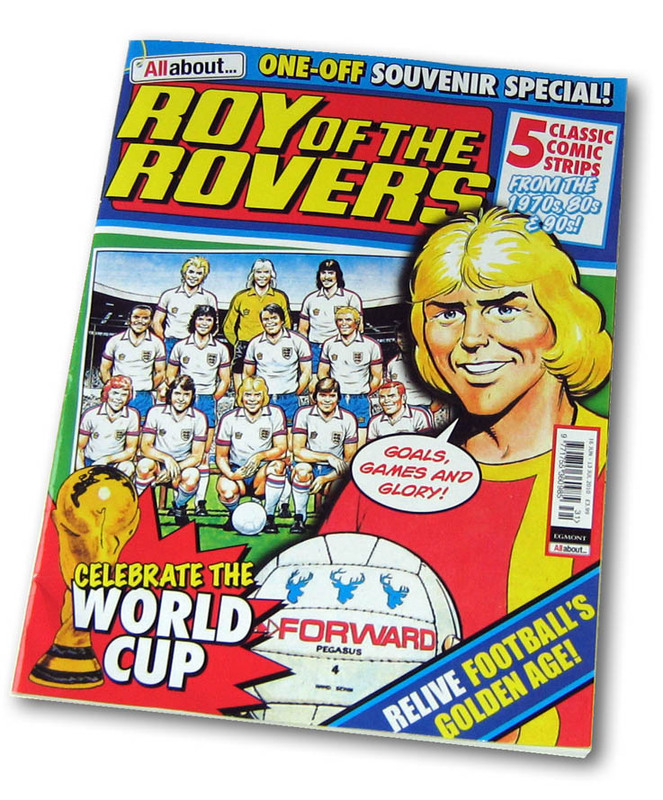 All About Roy of the Rovers is £3.99 and will be on sale from 16th June to 13th July. Introducing Dez Skinn Dot Com! Smartly designed by Chrissie Harper, the site shows what an important and key figure Dez has been in UK comics, from his early days on Fantasy Advertiser International, working on Buster and editing The Buster Book of Spooky Stories, through improving the UK edition of Mad, developing Monster Mag and House of Hammer, revamping Marvel UK by bringing in British talent, creating Starburst and Warrior, to the essential comics trade paper Comics International and more recently books on comics. (And all that is just a sample of Dez's busy career.) 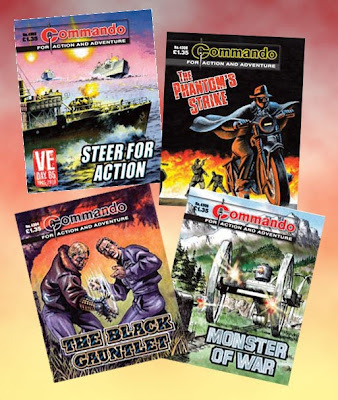 There's also a peek at covers for dummy issues of IPC's aborted Captain Britain venture (yes, they came up with the name before Marvel) and Quality Comics' unseen Danger Man and Legend Testers comics. 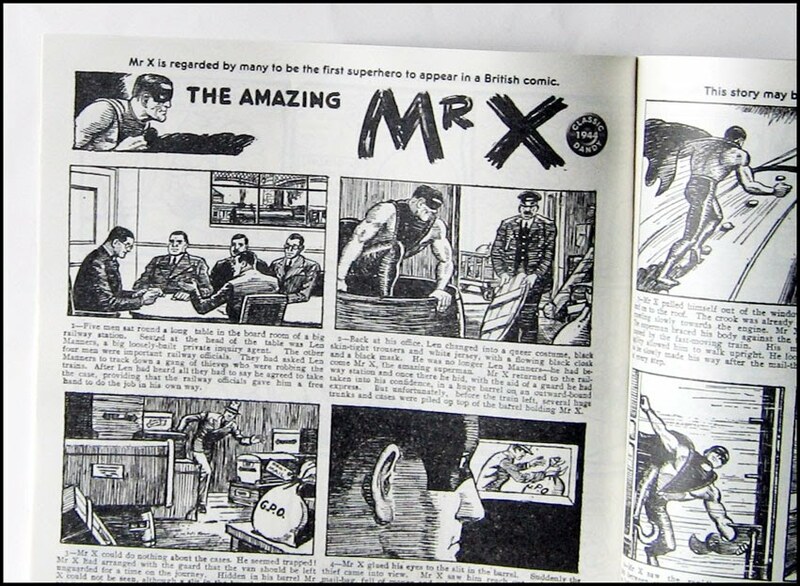 I always enjoyed Dez's editorials and anecdotes when he was editing Comics International and his website has that same informative and informal flavour. 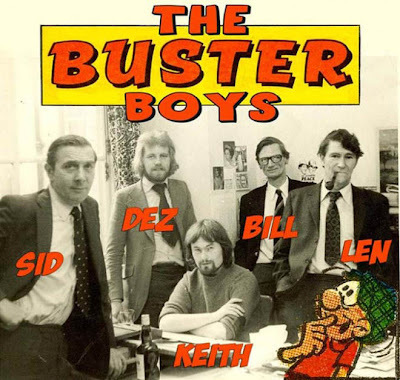 Compared to U.S. comics there has been so little written about the production aspects of British comics and people such as Dez have a lot of stories to tell of the glory days of Fleetway / IPC for example. There's a particularly good IPC staff photograph from the 1970s on the site (reproduced above) which puts faces to the names of Sid Bicknell, Len Wenn, Bill Reid, and Keith Robson. The website is still in development but there's already a lot of info there and Dez is continuing to add more. 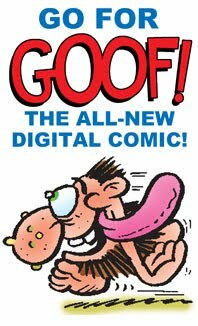 Dez has always had a commonsense approach to comics and I'm sure publishers today could benefit from his experience. dezskinn.com is well worth bookmarking for fans and pros alike. They were simply supposed to showcase some new 9-pounder field pieces. But in 1861, Austrian artillery Lieutenant Stefan Kircher and his battalion of gunners found themselves caught in the thick of the American Civil War. And fighting on the side of the Confederate South against the Union. They couldn’t know then that the day of victory would come in May, 1945, but they did know that only the lucky ones would survive the war. Brothers Rory and Hamish McLean, fighter pilots, would push their luck to the limit…and beyond! Part five of our seven-part series celebrating the end of the war in Europe in 1945. This time an air story with illustrations by two experts in the field. They couldn’t know then that the day of victory would come in May, 1945. And for Wehrmacht Major Franz Thomas, that day hadn’t come soon to save many lives…and he was sure it was his fault! Part six of our seven-part VE-Day series. The story is seen from the point of view of a German — something Commando has done many times over the years.